The Zone Read, also known as the Read-Option, is a simple running play, with two possible outcomes: (1) Either a quarterback keeper, or (2) a hand off to the running back off-tackle. The quarterback makes his decision based on the actions of the backside defensive end. If the end goes after the RB, the QB keeps it. If the end stays and guards the QB, he hands it off. That is the ‘Read’ part of the zone read. The ‘Zone’ refers to the blocking scheme, which I plan to cover in a later portion of this series. Ideally, when this play is run, the defensive linemen and linebackers are all blocked except for the backside defensive end. Not blocking this player frees up another lineman to block, however, this allows the backside defender complete access to the backfield, which is why this play requires the QB to make his read. On a zone read, the offensive line immediately crashes down to the play side (the side the RB runs toward). They use a zone blocking scheme, which in its simplest terms means they just block whoever is in their way, instead of blocking a specific defender. Occasionally, a lineman may pull to the backside (quarterback side) to give the QB a blocker. This immediate crash to the play side is designed to draw the defense to stop the run on this side of the line. Biting too hard toward that side is what lets Colin Kaepernick run for 45 yards in this play. Notice the immediate hard step each of the linemen take to their left. Also notice #50 of the defense is left completely unguarded. His actions will be read by the QB. The RB starts the play to the side of the QB and ½ to 1 yard back. When the ball is snapped, he runs into the ball just in front of the QB ready to receive the handoff. Unlike most running plays, he does not immediately grab the ball; he keeps his arms open, ready to have the ball taken away. Also unlike most plays, the RB is responsible for the handoff, since the QB’s focus is on the read. He ignores the free defender and focuses on finding a hole in the line to run through. If the ball is kept by the QB he then becomes another blocker. The RB always runs to the opposite side of the line as when he started. Here is the full play again. 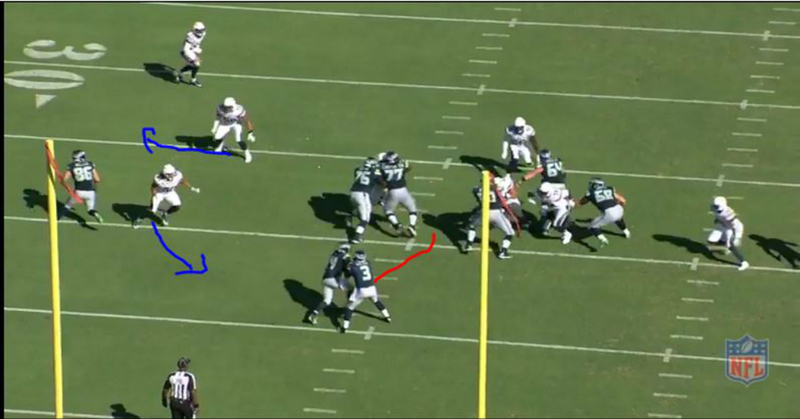 Russell Wilson takes the snap, sees the defender move to the running back, pulls the ball and runs for a 15 yard gain. This is what the QB is seeing at the moment as he makes his read – #50 is the man being read in this play. Notice all the defenders have their momentum moving to the left. This allows the QB to pull the ball and run around him, as he cannot recover in time. Also, notice how much #50 has to turn his hips to follow the play. 2. The EMOL can also stay on the edge and attempt to contain/tackle the QB; if this happens the QB will let the RB take the ball and fake a run to the edge. This is the default option, and if the QB is ever in doubt, it should be handed off. Here is the full play. This time Russel Wilson receives the snap, and sees the defender drive up the field past the line of scrimmage, he hands the ball off and Marshawn Lynch runs for a 7 yard gain. Here is a series of images showing the EMOL and his path to follow the play. Notice he goes in hard and ends up level with the RB. This means he has to travel the same distance as the RB, but from a standstill while the RB has a running start. This is what the QB is seeing as he makes his read. Notice the EMOL has his weight moving forward, and is several yards away from the offensive line. He does end up making the tackle, but at 5 yards past the line of scrimmage. A successful defensive counter to the zone read requires several elements. Generally, the defense is more successful at stopping the running back, which means it is typically better for the DE to commit to the QB. This requires a safety to make the tackle, which will usually happen 5-7 yards out, or for a linebacker to shed his block to make the play. When the DE commits to the RB, it is typically when the huge runs get broken, as this can put the QB 1-on-1 with either a corner or a safety. In this play, Colin Kaepernick takes the snap, sees the defender move toward the running back, pulls the ball and runs toward the sideline. He is chased by the OLB and is run into a cornerback, forcing him to slide for a 2 yard loss. Both of these attempts by Kaepernick are stuffed because #50 moves to the RB, but stays neutral enough to chase Kaepernick into a cornerback who has shed his block. This image shows the moment that the QB makes his read. Notice how far #50(the player on the far left) is leaned towards the line of scrimmage. The QB made the correct read and kept the ball, however, the athletic plays by other members of the defense led to a loss of yards. Here is an example of an incorrect read. Drew Stanton takes the snap, sees the defender take a step toward the running back and makes the incorrect assumption he will continue towards the RB when actually, the defender recognizes the play and gathers himself to make the play for a 3 yard loss. The EMOL’s first 2 steps lead the QB to pull the ball and keep it, however, the EMOL had not committed himself to the RB and was able to tackle the QB behind the line. Here is the moment the QB makes his read. Notice how #51 has his hips completely underneath him. He is able to quickly move to contain the QB. The correct play would have been to hand off to the running back, due to the lack of commitment by the EMOL. the Zone Read is more successful than the average run. With an average of 4.6 yds/attempt across the NFL, versus 4.1 for other run plays. Houston (#50) takes the same attack in both an offense success and defense success play. How did each play have such different results? All these plays were ran with a TE and 3 WRs. Do you think it would be more effective out of a different formation? Kaepernick had a pulling TE as a lead blocker. Was this helpful, hurtful, or did it make no difference? Houston (#50) got credit for a tackle on Kaepernick. Is this deserved? Or should it have gone to a different player? Most of these plays were against a nickel defense. Would a stacked box (4-4, 5-2) make a zone read more or less effective? Does the zone read require a smart quarterback? An agile quarterback? Does the zone read become more or less effective on a team that plays more out of the shotgun (Eagles) versus one that plays mostly from under center (Patriots)?